Ryburn United face the first of two crunch games in four days tomorrow (Wednesday) when they take on Carlton Athletic in the semi-final of the West Riding Challenge Cup (7.30). 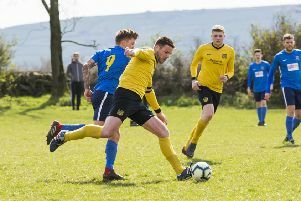 The Halifax AFL side will start big underdogs at the county FA’s Woodlesford headquarters against opponents riding high in the West Yorkshire League. Craig Walker’s side have got past Rimington, Ilkley Town, Skipton LMS, Leeds City Rovers and Robin Hood to get this far. The second semi-final between Steeton and Boroughbridge is on April 19. Ryburn have a second semi-final on Saturday when they take on newly-crowned Halifax AFL champions Illingworth St Mary’s in the Jack Haymer Challenge Cup at Natty Lane, Illingworth. Saints are involved in one of three Halifax AFL matches tomorrow. There is a big game in Division One with title favourites Shelf FC away to in-form Denholme United. Wednesday’s Halifax AFL - Premier: Illingworth St Mary’s v Warley Rangers (ref N.Coupe ). Division One: Denholme United v Shelf FC (S.Adams). Division Two: Shelf United Res v Junction Inn (C.Walshe).